This paper explores the role that ecosystems can have in the decision making framework for urban air pollution mitigation in Toronto, Ontario, Canada. The focus is on management planning of green roof implementation to mitigate the effects of urban air pollution. The importance of Toronto's impact on surrounding ecosystems, conservation areas and their fragile habitats is often overlooked. Through a literature analysis of primary sources, the need for consideration of these nearby ecosystems in management planning is shown. Toronto's proximity to aquatic and terrestrial ecosystems causes the dual effects of the urban heat island effect and urban air pollution to carry over to these systems. The city should address the impact on these systems in terms of mitigation options. Toronto is currently building many new residences, commercial properties and infrastructure projects. Investigating the effects of green roofs in Toronto and the effects that this could have on the city and surrounding ecosystems provides a better framework for decision makers in the city to decide whether green roofing has a place in Toronto. By providing a sound scientific background on the topic relevant stakeholders and decision makers will be able to properly gauge the need and effects the implementation of green roofs in the city could have on surrounding ecosystems. As rapid urbanization occurs globally the issues of ensuring urban health of humans and the natural environment is receiving increasing attention (UNEP, 2015). From an ecosystems perspective there are many different facets to be considered: air quality, water quality, urban infrastructure, biodiversity, emissions levels, human population levels, waste levels, energy use, etc. These all have significant impacts on the populations and surrounding areas. Cities increasingly are turning to mitigation measures to help negate the harmful effects of city life. Two significant impacts of large urban spaces are UHI and urban air pollution (UNEP, 2015). Combatting these dual effects is often a costly process and as such a well-established decision making framework needs to be put in place and all stakeholders must be considered. Green roofs have come in to use throughout the world to help mitigate some effects of urban life. In Toronto however there has been a failure to recognize the impact the green roofs can have in helping mitigate the UHIs amplification effect on urban air pollution and the effects that has on surrounding ecosystems. 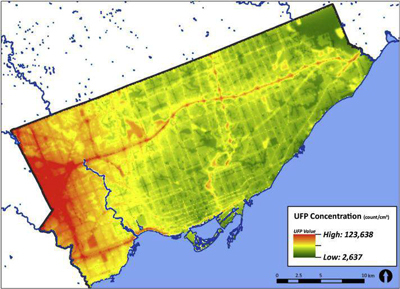 For the purposes of this analysis the focus will be on the place of surrounding ecosystems in a decision making framework for the implementation of green roofs as a mitigation tool for the effect of Toronto as an urban centre on surrounding ecosystems through the UHI effect and urban pollution. This is an important topic of research as Toronto is currently going through large increases in the construction of residential, commercial, and infrastructure projects throughout the city. As these projects are built both vertically in the downtown core to increase density and horizontally to expand the city they are increasing the dual UHI and urban air pollution effects (Gough and Rozanov, 2001). This is also putting more pressure on the few intact ecosystems surrounding the city. This is a key time for decision makers to consider mitigation efforts. The city of Toronto has worked to explore the efficacy of green roofs as mitigation tool. However, the decision making framework has always been based on an anthropocentric view point. This takes away from the relevance of surrounding ecosystems' worth and the various ecological goods and services that they provide. As such the effects that UHI and urban air pollution have on surrounding ecosystems needs to be illustrated and the potentially affected areas and species identified. This will give decision makers a better understanding of the true magnitude that the UHI and air pollution have beyond the human level. In order to investigate the place of ecosystems in the decision making framework, a review of relevant history and past research on the topic of the heat island effect, urban pollution, and their typical implications for human populations and surrounding ecosystems was carried out. Drawing from primary sources and grey literature based around technical reports from the municipal government of Toronto, the city will be situated as an urban heat island, its levels of urban pollution will be examined, an illustration of the effects that this has on the people of Toronto and surrounding ecosystems specific to Toronto will be explored. This provides a framework to analyze the current decision making framework for green roofs as a management tool and their efficacy in combatting the effects of heat islands and urban pollution. The current state of research and the planning framework for potential green roofs as a management tool localized to Toronto and the predicted effects that it would have on surrounding ecosystems is illustrated. This will be concluded by recommendations for management. However, this approach is limited in that as a preliminary report showing the linkages, it lacks the quantitative data and models needed to show the more exact effects that varying levels of urban air pollution and the UHI effect have on surrounding ecosystems over specific spatial and temporal scales. The UHI effect causes higher temperatures in urban areas compared to surrounding rural areas. This is a well-founded effect that has been observed and documented globally (Santamouris, 2007; Tran, et al., 2006; Yang, et al., 2015). The UHI effect increases with the population density and size of cities (Gough and Rozanov, 2001). Toronto is a rapidly expanding city set to face continually growing UHI effects. UHI effects globally have been observed to cause as much as an 11 degree Celsius difference by mid-morning (Aniello, et al., 1995). The UHI effect and the elevated temperatures lead to a rise in energy usage, particularly for cooling. Due to Toronto's seasonal variance in weather, this can cause cooling systems to have to work much harder than they already do. In Toronto the UHI effect has been observed to be as much as 3.25 degrees Celsius (Gough and Rozanov, 2001). The UHI in turn then exacerbates problems of urban air pollution by placing additional needs on the cooling systems throughout the city leading to more air pollution (Gough and Rozanov, 2001). Air pollution is a well-recognized problem globally and the United Nations Environmental Programme (UNEP) estimates that "more than 1 billion people are exposed to outdoor air pollution annually" and "Urban air pollution is linked to up to 1 million premature deaths and 1 million deaths each year" (United Nations Environmental Programme [UNEP], 2015). Not only does this cause loss of human lives and livelihoods, but it is also an economic burden as "Urban air pollution is estimated to cost approximately 2% of GDP in developed countries and 5% in developing countries" (UNEP, 2015). It is evident that this a problem needs to be addressed. In addition Toronto as a rapidly urbanizing city faces particular risks as "Rapid urbanisation has resulted in increasing urban air pollution in major cities" (UNEP, 2015). Toronto is no exception to these problems and the municipal government has been actively considering mitigation measures such as green roofs. The combination of UHI and UAP causes significant problems for human populations such as increased heating costs, premature death, and aggravating illnesses (Zupanic et al., 2015). Surrounding ecosystems have also experienced negative effects of nearby urban air pollution and animals have been found to be early indicators of damage (Newman & Schreiber, 1984). Even though it has been noted that urban air pollution controls are in place and that "most developed countries have put in place measures to reduce vehicle emissions, in terms of fuel quality and vehicle emission reduction technologies" (UNEP, 2015), there are still significant emissions of pollutants. Further, these two effects have a complementary effect on one another and it has been noted by Sarrat (2006) that "both nocturnal and diurnal urban effects have an important impact on the primary and secondary regional pollutants, more specifically ozone and nitrogen oxides (NOx)" This serves to illustrate the relationship between the UHI and urban air pollution. In addition "the spatial distribution and the availability of pollutants are significantly modified by the urbanized area mainly due to enhanced turbulence." (Sarrat, 2006). The dual effect of UHI exacerbating urban air pollution and its effect on surrounding ecosystems is well documented. The effects on ecosystems can be quite severe. Looking at cities globally it is found that "Sulphur dioxide (SO2) and coal smoke formerly dominated the developed world and remain a growing problem in the developing countries. [However] In both regions, the ‘modern' pollutants, in the form of nitrogen oxides (NOx), ozone (O3) and fine particulate matter (PM10), are also major problems for urban vegetation." (Bell, et al., 2006). This shows the need for management strategies for urban pollution levels. The study continued to show that "despite generally lower pollutant levels in the developed world, there is evidence that both crops and wild species are adversely impacted." (Bell, et al., 2006). This contributes to the idea that in a management framework for adaptation and mitigation of these effects surrounding ecosystems need to be considered a stakeholder and should be given due consideration. Toronto's heat island effect has been established and studied in the past. 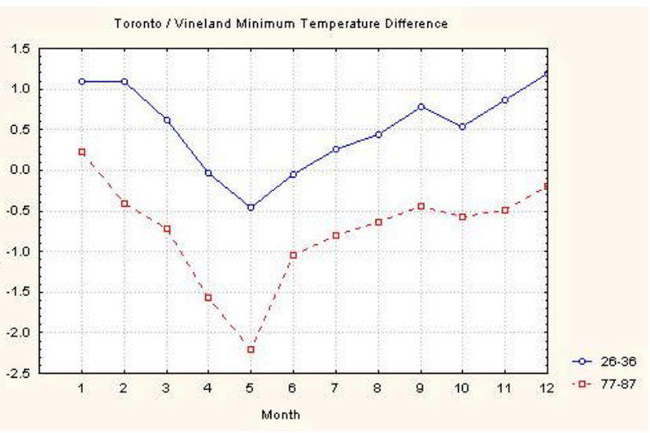 Gough and Rozanov (2001) did a comparison study of the UHI effect by looking at temperature differences between the downtown core, Pearson airport and Vineland. Observed temperature differences show a maximum difference of +3.25 degrees Celsius during the day time between Pearson and Toronto. There are also significant diurnal temperature differences observed year round. Though this is a smaller figure than in other larger global cities it still leads to a significant effect on the surrounding ecosystems and the people of Toronto. The range in diurnal temperature changes can be seen in the following two figures. What is important to note about these figures is how significant the UHI is in terms of proximity to the city. As a direct measurement Pearson airport lies 19.31 km from the city centre through mostly urban centres. This shows the difference in temperature due to the UHI the further distance travelled from the city centre. Vineland lies 56.32 km from the city centre mostly over Lake Ontario. However, Vineland is on the Niagara Peninsula and has too many different geographical features and is too far from Toronto to establish a causal link with UHI. Urban air pollution in Toronto is considered to be when air contains "one or more substances in amounts harmful to people and plants" (Clean Air Partnership, 2015). The air pollution levels in Toronto are monitored by Public Health Toronto and Environment Canada and measured on the Air Quality Index (Pengelly and Sommerfreund, 2004). Three pollutants are considered when calculating the burden of illness on the population. These are ground-level Ozone (O3), fine particulate matter (PM2.5), Nitrogen Dioxide (NO2). "When the proportion of the burden attributable to each individual pollutant is considered, NO2, PM2.5, and O3 contribute the most to cardiovascular and respiratory ill health. They account for about 13%, 69%, and 14% of premature mortality and about 35%, 33%, and 29% of hospitalizations, respectively" (Campbell & Gower, 2014). The effects on Urban Air pollution in Toronto have been broken down by the city. A summary view can be seen in the figure below. Of these sources, traffic has the greatest impact on health, contributing to about 280 premature deaths and 1,090 hospitalizations each year, or about 20% of all premature deaths and 30% of all hospitalizations due to air pollution (Pengelly and Sommerfreund, 2004). When only pollutants emitted within Toronto's boundaries are considered, the proportions of premature deaths and hospitalizations attributable to traffic are 42% and 55%, respectively" (Campbell & Gower, 2014). Additionally pollution in Toronto comes from transboundary sources with 21% out of province and 25% out of country (Pengelly and Sommerfreund, 2004). The number of deaths and hospitalizations shows the need for additional management strategies within the city for air pollution and UHI which complements air pollution and aggravates the problem. Campbell and Grower (2014) elaborate that "Residential and commercial sectors are the next most important local contributors to health impacts from air pollution, accounting for about 190 premature deaths and 400 hospitalizations (or 28% of deaths and 20% of hospitalizations arising from pollution emitted in Toronto). The main source of emissions from residential and commercial properties is combustion of natural gas to heat homes and buildings, as well as heating water" (Campbell & Gower, 2014). Additionally "based on emissions reported to the National Pollutant Release Inventory (NPRI), industrial sources account for about 120 premature deaths and 200 hospitalizations (or 18% of deaths and 10% of hospitalizations arising from pollution emitted in Toronto)." Finally the least harmful source of air pollution in Toronto is "mobile non-road sources such as emissions arising from rail and air traffic contribute about 80 premature deaths and 280 hospitalizations (or 12% of deaths and 14% of hospitalizations due to pollution emitted in Toronto)." (Campbell & Gower, 2014; Pengelly and Sommerfreund, 2004). Currently there are insufficient management strategies to internalize the negative externalities generated by these polluters. The distribution of urban air pollution within the city boundaries is visible in the figures below. In looking at impacts on the non-human environment in surrounding ecosystems, a review of studies looking at animals as indicator species in response to urban air pollution was consulted. It was found that "animal species and populations can act as important indicators of biotic and abiotic responses of aquatic and terrestrial ecosystems." (Newman & Schreiber, 1984). Further it was found that "These responses can indicate long-term trends in ecosystem health and productivity, chemical cycling, genetics, and regulation." As well as that "for short-term trends, fish and wildlife also serve as monitors of changes in community structure, signaling food-web contamination, as well as providing a measure of ecosystem vitality." (Newman & Schreiber, 1984). This serves to frame the argument of incorporating ecosystems as stakeholders in management decisions because they not only are affected but can serve as an indicator to monitor the progress of mitigation efforts. A green roof is defined as "a vegetated roof or deck designed to provide urban greening for buildings, people, or the environment." (Dvorak & Volder, 2010). These are starting to become more common across North America but are noted for being originally "Made popular across Europe over the past few decades" (Dvorak & Volder, 2010) and it has been observed that "green roofs are now becoming more familiar to North Americans as some cities have built green roof pilot projects and adopted incentives for using green roofs or even require their use." (Dvorak & Volder, 2010). There have been several pilot projects in Toronto but so far, they have not been made mandatory as they have been in some European countries such as France (Agence French-Press, 2015). The city has the opportunity to explore this legislation as "Green roof standards and guidelines are also emerging to be used for governance and project specification." (Dvorak & Volder, 2010). However, before this is to happen more needs to be understood about their application in the context of Toronto. As it currently stands "much is known about the application of green roofs across Europe [however] much less is known about their application across North America's diverse ecological regions. When considering the many decisions required in applying green roof technology to a specific place, there are few choices more critical to their success than the selection of appropriate vegetation." (Dvorak & Volder, 2010). In the application of this study a review of green roof research was conducted in order to "investigate what is known about the application of plants on green roofs across North America and their ecological implications." (Dvorak & Volder, 2010). Results of this study indicated that plant survival rates and thus the effectiveness of the green roofs varied across ecoregions and as such they must be tailored to the unique circumstances present. As the study indicates "as green roofs continue to become regulated and adopted in policy, further development of standards and guidelines is needed" (Dvorak & Volder, 2010). Green roof usage in city centres can actively work to combat the UHI. This has been studied and examined throughout the world and is well documented. It has been noted that "Green roofs are a passive cooling technique that stop incoming solar radiation from reaching the building structure below. Many studies have been conducted over the past 10 years to consider the potential building energy benefits of green roofs and shown that they can offer benefits in winter heating reduction as well as summer cooling" (Castleton, et al., 2010). This is accomplished because "Green roofs present the opportunity to expand the presence of vegetated surfaces by replacing impermeable surfaces in urban areas, providing for a reduction in peak summer urban heat island temperatures." (Banting, et al., 2005). Green Roof's benefits in combatting urban air pollution is also well examined. This is due to the way in which smog forms when Nitrogen Dioxide (NOx) reacts with volatile organic compounds. This process is accelerated by higher ambient air temperatures (Banting, et al., 2005). Three main ways that green roofs work to combat air pollution besides lowerering ambient air temperatures are: reducing the demand on polluting energy production plants from a reduced demand for cooling (Konopacki & Akbari, 2001), the trapping of particulates in foliage (Johnston, 1996), and dissolving or sequestering gaseous pollutants, particularly CO2 through the stomata of their leaves (Nowak and Crane, 1998). Green roofs as a management tool in Toronto have been examined in parts through various studies (Banting et al., 2005; Bass et al., 2002; Gough and Rozanov, 2001; Zupancic, et al., 2015.. A 2005 study conducted by Ryerson University in partnership with the City of Toronto attempted to quantify the value added to the city based on a 100% coverage rate. The parameters for the study were as follows: "The benefits on a city-wide basis were calculated based on the assumption that 100% of available green roof area be used. The available green roof area included flat roofs on buildings with more than 350 sq. m. of roof area, and assuming at least 75% of the roof area would be greened. The total available green roof area city-wide was determined to be 5,000 hectares (50 million sq. m.)." 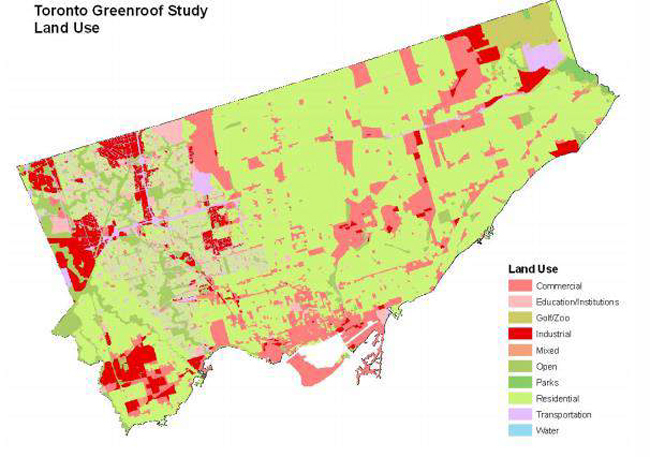 (Banting et al., 2005) The determination of available green roof space was based on the following land use study. "The benefits were determined as initial cost saving related to capital costs or an amount of annually recurring cost saving" (Banting, et al., 2005). One limitation acknowledged in that study was the assumption of a 100% coverage rate. This is not a feasible solution and does not represent the best solution. It is known through research that "Older buildings with poor existing insulation are deemed to benefit most from a green roof" (Banting, et al., 2005). As such it may be the most feasible place to start implementing green roofs. Bass (2002) found that with a 5% coverage of the city, starting at the most feasible sites, green roofs "reduce(s) UHI and with sufficient moisture for evapotranspiration, a limited green roof coverage decreases UHI and will enhance the greening strategy in core". (Bass et al., 2002). Further work has been done to advance the argument for green roofs even in a limited area. In a review analysis of the implications of green roofs Zuapncic (2015) found that "Emerging evidence also suggests that closely spaced and connected smaller green spaces can provide greater cooling effects to adjacent urban areas than large individual parks with open grass areas." (Zupancic, et al., 2015). This indicates that green roof coverage need not be 100% but instead can be smaller in scale when dispersed favourably. Green roofs can also be used in Toronto in order to connect fragmented habitat. In working on this issue for Toronto city planning Bass (2002) found that "green roofs can be used to connect fragmented habitats when installed in aggregation especially if located near fragmented ground-level habitats and that "Where technically feasible, green roofs should be designed to protect sensitive biological communities and avoid aggressive species. By designing green roof scapes that include important habitat forming and forage species into planting designs Toronto will encourage the proliferation of biodiversity across urban green roofs. In addition to strengthening existing green corridors, green roofs represent an opportunity to create new green space in areas that are otherwise unsuitable for natural restoration" (Bass et al., 2002). The enhancement of habitat corridors specifically for migratory species would have an impact on the surrounding conservation areas which are currently well noted for their importance as a habitat for migratory species. Agence FrancePresse (2015). France decrees new rooftops must be covered in plants or solar panels. The Guardian, Paris, France. Akbari, H. (2002). 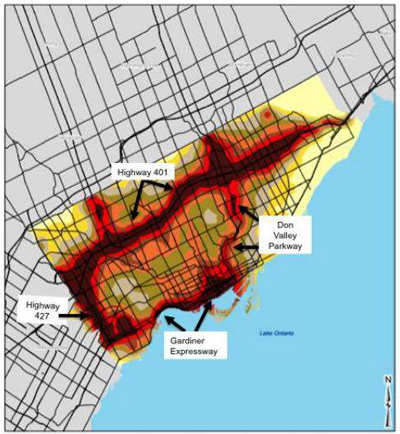 Energy impacts of heat island reduction strategies in Toronto, Canada. Toronto Urban Heat Island, Toronto, Ontario. Banting, D., Doshi, H., Li, J., Missios, P., Au, A., Anne Currie, B., & Verrati, M. (2005). Report on the environmental benefits and costs of green roof technology for the city of Toronto. (Academic). Toronto: Dept. of Architectural Science, Ryerson University. Bass, B., Krayenhoff, S., Martilli, A., & Stull, R. (2002). Mitigating the urban heat island with green roof infrastructure. Unpublished manuscript. Campbell, G. (2014). Path to healthier air: Toronto air pollution burden of illness update. (Staff Report). Toronto: City of Toronto. Crins, W. J., Gray, P. A., Uhlig, P. W. C., & Wester Monique C. (2009). The ecosystems of Ontario, part 1: Ecozones and ecoregions. (Technical). Peterborough, Ontario: Ontario Ministry of Natural Resources. Currie, B. A., & Bass, B. (2010). Using green roofs to enhance biodiversity in the city of Toronto. (Technical). Toronto: Toronto City Planning. Gough, W., & Rozanov, W. (2001). 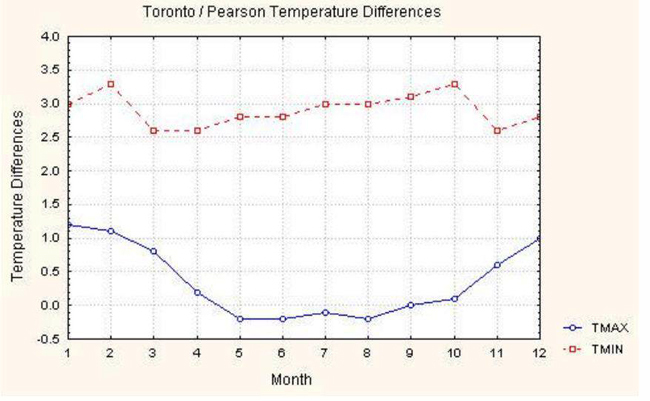 Impact of expanding urbanization on Toronto, Ontario's temperature record. Unpublished manuscript. Harrington and Hoyle ltd. (2009). Rattray marsh class environmental assesment. (Technical). Toronto: Credit Valley Conservation Area. Johnston J. (1996). Building green: A guide for using plants on roofs, walls and pavements. (Technical). London: The London Ecology Unit. Konopacki, S., & & Akbari, H. (2001). Energy impacts of heat island reduction strategies in the greater Toronto area, Canada. (Technical).Lawrence Berkeley National Laboratory. Nowak, D.J., Crane, D.E. (2000). The urban forest E!ects (UFORE) model: Quantifying urban forest structure and functions. In Proceedings of the Second International Symposium: Integrated Tools for Natural Resources Inventories in the 21st Century, USDA Forest Service, North Central Research Station, St. Paul, MN. Pengelly L.D and Sommerfreund, J. (2004). Air pollution-related burden of illness in Toronto: 2004 update. (Technical). Toronto: City of Toronto. Royal Botanical Gardens. (2015). Cootes paradise. (Informational).Royal Botanical Gardens. Zupancic, T., Westmacott, C., & Bulthuis, M. (2015). The impact of green space on heat and air pollution in urban communities: A meta-narrative systematic review. (Technical). Toronto: David Suzuki Foundation.